Touch of Class Shell Island Tabletop Water Fountain Multi Earth | Fountain City Art Ctr. 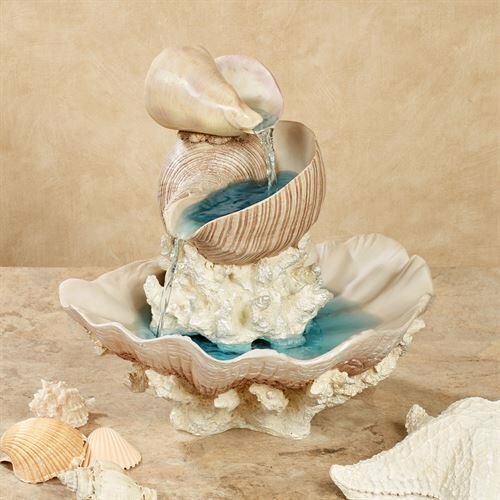 The beauty of the beach can be found indoors with the Shell Island Tabletop Water Fountain. Handpainted, resin table accent features stacked shells and coral. Submersible, UL listed pump is included. Indoor use only. Table fountain measures 14 Wx12.5 Dx13 H; weighs 11 lbs. For best results, use distilled water without minerals added. This item is our exclusive! Coastal-style table fountain Features stacked resin shells and coral Beautifully painted by hand Submersible pump is included. If you have any questions about this product by Touch of Class, contact us by completing and submitting the form below. If you are looking for a specif part number, please include it with your message.